The American red wolf is one of United States’ greatest wildlife conservation stories. Red wolves were on the brink of extinction along the American Gulf Coast during the late 1970s when the U.S. Fish and Wildlife Service (USFWS) made a bold decision to purposely remove all remaining red wolves from the wild. But over the past few years the wild population is once again dwindling (from about 130 individuals in the wild to a mere 30) amongst political controversy and pressure from a number of landowners to be able to shoot the wolves on their land. In addition to the wild population, there are approximately 200 red wolves in captivity. The entire red wolf population descends from 14 individual animals, of which only 12 are genetically represented. Brzeski and her coauthors published their findings, “Rediscovery of Red Wolf Ghost Alleles in a Canid Population Along the American Gulf Coast” Dec. 10, 2018 in the journal Genes (DOI: 10.3390/genes9120618). The researchers obtained tissue samples from two roadkill canids on Galveston Island and conducted analyses with genome-wide single nucleotide polymorphism and mitochondrial DNA from 60 animals that represented all potential sources of ancestry for the Galveston Island canids: coyotes, red wolves and gray wolves. 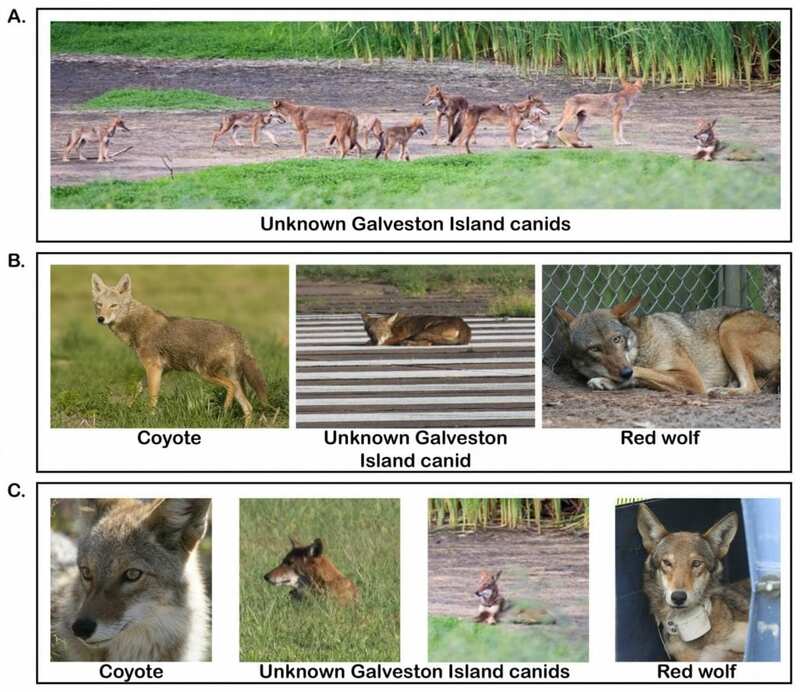 Brzeski and others found that the Galveston Island canids have both red wolf and coyote alleles, likely related to species interbreeding during the 1970s as coyote populations expanded across North America. This is significant because it means that red wolf genetics persist in the American southwest nearly 40 years after the species was thought to have become entirely extinct in the wild. The population on canids on Galveston Island could represent a reservoir of red wolf genes that could be used to bolster the North Carolina. “This research shows hybrids can have conservation value through harboring extinct genes from endangered parent species,” Brzeski said.